It’s National Peanut Butter Day! To celebrate I’m sharing one of my favorite recipes from my cookbook, Nut Butter Universe. It’s the stir-fry with spicy peanut sauce that I love to make often, usually varying the vegetables and protein with whatever I have on hand and sometimes tossing with cooked noodles instead of serving over rice. The one thing that remains constant is the peanut sauce — although I often double the amount of sauce because, well, it’s peanut sauce!!!! Just for today I’ve renamed the recipe (and added a little extra peanut butter!) in honor of National Peanut Butter Day! A creamy peanut sauce is the star of this versatile stir-fry. You can vary the vegetables according to your personal taste and their availability. In addition, the amount of heat in this dish can be controlled by the amount of red pepper flakes added to the sauce. 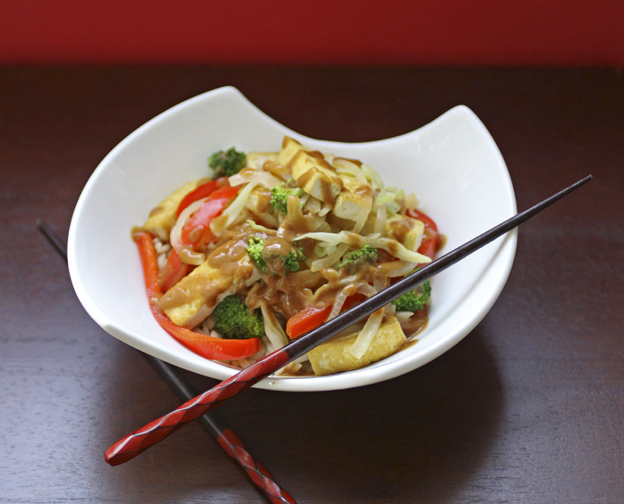 Strips of extra-firm tofu are a pleasant foil for the spicy sauce. This recipe calls for serving it over rice, but it’s also delicious tossed with cooked rice noodles instead. 1. In a bowl, a food processor, or a blender, combine the water, peanut butter, tamari, vinegar, sugar, ketchup, garlic, ginger, and red pepper flakes, and blend well. 2. Pour the mixture into a saucepan and bring to a boil. Reduce the heat to low and simmer for 5 minutes, stirring occasionally. Add the cornstarch mixture and cook, stirring, until the sauce thickens. Taste and adjust the seasonings, if needed. Remove from the heat and set aside. Add a little water if the sauce becomes too thick. 3. Heat the oil in a large skillet or wok over medium-high heat. Add the tofu and stir-fry until golden brown, about 3 minutes. Remove with a slotted spoon and set aside. Add the onion, broccoli, and bell pepper, and stir-fry for 3 minutes. Add the cabbage and mushrooms and stir-fry 3 minutes longer, or until the vegetables soften, adding a little water if the vegetables start to stick. 4. Return the tofu to the skillet. Add the sauce and stir-fry to coat the vegetables. Serve over the rice and top with the chopped peanuts. From Nut Butter Universe by Robin Robertson. ©2013 Robin Robertson. Used by permission from Vegan Heritage Press. Photo by Lori Maffei. Looks great! How do I print out the recipe? JoAnne, I guess you can either press “File” then “Print” or else cut and paste it into a new document to print, right? Looking forward to preparing this yummy dish. Thanks for sharing it!